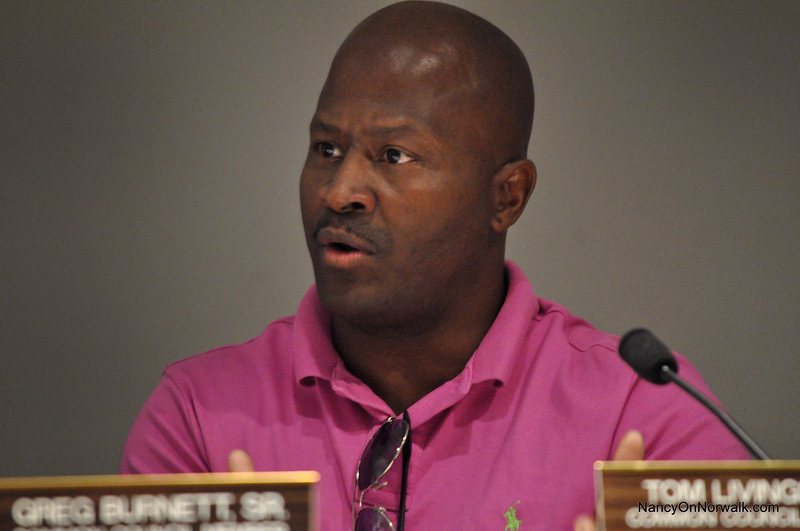 Common Council member Travis Simms (D-District B) objects Thursday to the deal regarding 98 South Main St., the South Norwalk Community Center. NORWALK, Conn. —The proposal to buy the South Norwalk Community Center’s half of the former “NEON building” moved forward Thursday, over the objection of a South Norwalk Common Council member. “I just think we need to be more fiscally responsible and not keep bailing an agency out that’s been pretty much in default since its inception,” Travis Simms (D-District B) said, comparing what is happening now to the South Norwalk Community Center when it is unable to pay bills to what happened to Norwalk Economic Opportunity Now (NEON) “didn’t have the ability to pay.”“They went into default and the city acquired their part of the property,” Simms said. The city acquired half of 98 South Main St. last year after NEON’s lengthy bankruptcy proceedings concluded. The Council Finance Committee approved the deal over Simms’ objections. It will go to the Board of Estimate and Taxation (BET) for approval on July 9 and to the full Council for a vote on July 10. The proposal is to use $500,000 of the $3.5 million paid by GGP to the city in exchange for the elimination of the hotel planned for The SoNo Collection, the mall under construction on West Avenue, for this deal, spending $300,000 to buy half of 98 South Main St. from the South Norwalk Community Center and budgeting $200,000 for repairs to the building. The Council last year promised to use GGP’s money to help South Norwalk. The building at 98 South Main was constructed with $1 million of grants obtained by the city between 1981 and 1987, with ownership of the property being transferred to Norwalk Economic Opportunity Now (NEON) and SoNoCC in August 1987. The deal includes a new organizational structure for the South Norwalk Community Center to “make it more welcoming to the entire Norwalk community a and more effective at providing necessary community activities and social services to the Norwalk community,” a letter written last week by Corporation Counsel Mario Coppola to the Finance Committee states. Thursday’s meeting began with two members of the community expressing reservations about the deal. “I think it odd in this kind of agreement to dictate the Board structure of non-for-profit unless there are some issues or problems that the public needs to know if we are going to be partners with this not-for-profit,” Diane Lauricella said. She also suggested an audit be done regarding SoNoCC’s lack of building maintenance and also regarding NEON, and suggested that BET Chairman Ed Camacho will have to recuse himself from the issue due to his previous involvement in the South Norwalk Community Center. She also echoed concerns that have been expressed about the transparency of the deal. State Rep. Bruce Morris (D-140) on Tuesday said stakeholders were not informed of the developments. Deb Goldstein objected to the use of GGP funds. “I think it is fair to say that the community expected a net gain on that money when it was used on their behalf. I think it is also fair to say that with the city already owning only half of the building it would be expected that this stuff would have been done in any case,” she said. SoNoCC has received grant money to renovate the building and, “Now you’re going to value the building based on renovations we paid for, and pay a partner again,” Goldstein said. She also questioned the proposed makeup of the SoNoCC Board, asking why two members would be appointed by Norwalk’s two Chambers of Commerce, when social service skills are needed. It doesn’t seem appropriate unless job training and internships will be offered, she said. The city just appropriated $300,000 to pay off electricity bills and repairs for SoNoCC, he said. The 2018-19 Norwalk budget book shows $351,800 was allocated to the Department of Public Works for the South Norwalk Community Center, with the summary saying it was for maintenance costs. A lot of CDBG funding went to NEON for building improvements, Council member Doug Hempstead (R-District D) replied. “That’s when NEON was in operation. I am talking about since NEON has defaulted,” Simms said. The city should just take the building, Simms said. “Can I finish my question?” Hempstead said, a reference to having been interrupted. He asked Norwalk Finance Director Bob Barron if the Council could get an accounting of the CDBG funding awarded to NEON and the South Norwalk Community Center, before the next Council meeting. Barron said yes, and then added that he wouldn’t characterize the deal as a “bailout” of the South Norwalk Community Center. It’s an acquisition, as described in the memos sent to the Council, he said. “Having a partner that is unable to share in joint liability and utilities, and all of that is a difficult situation,” Barron said. Many possibilities have been discussed for the building but they can’t be pursued “when you have a tenant that isn’t paying,” he said. The $200,000 won’t be spent right away but, “I think as the building is marketed and we look for the right mix of tenants or single tenant, …we will have better idea of what needs to be done,” he said, mentioning that a new tenant would like also invest a similar amount of money in the building. I agree with Simms. Let SoNoCC fail! It’s already happening. Once they fail the property defaults back to the City. Then you put all of the money into fixing the building. Why the rush to bail SoNoCC out? In what world is this proper? If two entities own a building 50/50 and one of those entities goes bankrupt, the other entity doesn’t suddenly own that first entity’s share. The estate of the first entity does. As much as I hate to agree with Travis, this does seem more like funding SoNCC in a backhanded way. I don’t have any ill will to SoNCC, or agree with the criticisms made, but this seems to be a clear misappropriation of the city’s money. Or will some kind person help me understand? I’m a little confused here…. Did the City own a building and then “transfer ownership” i(ie.Give it away for free) and is now paying the same group $300,000 to buy the same building that was given to them for free??? Does Mayor Rilling’s “Reorg Plan” improve how the City provide appropriate services to our lower income SoNO residents and assign appropriate responsibilities to the Council for oversight. Or are we still dealing with the oversight issues that allowed NEON’s challenges to continue ? I would really love to read the entire story behind NEON. As a taxpayer, I think it was clear that funds were misappropriated for years under the guise of inflated salaries and unqualified individuals (friends) getting jobs (to say the least). From the stories I’ve heard some of the actions of NEON bordered on criminal. This seemed to get swept under the rug and the full story never really was told. @JohnS. Let’s put it this way- if you did what the leadership of NEON did you would be in jail. SoNoCC is about to get $300k from the City that they are not entitled to. All the city needs to do is wait a few more months and SoNoCC will be bankrupt (officially). Is ithe Mayor justifying this handout with free money from GGP? Who’s watching the store? More land use mismanagement of taxpayer dollars. Just adding it to the list. This is all before the EPA has the results that contamination is not coming from the property that was reported in a RDA meeting with the RDA hired engineers .Contamination was coming from above Ryan park was said many times during the RDA meeting. Where is Susan and Tim on this? Its also possible with all that contamination in Ryan Park it could of migrated to under NEON as well lets keep an open mind on this . If it is the source of the PCB’s in Ryan Park would the city stand alone in remediation or would a hurting South Norwalk Community Center be part responsible for testing and remediation? Other nasty chemicals were also found also maybe the reason the waste is leaving under one umbrella. Contamination was found withing feet of the NEON foundation confirming what the RDA had reported thru its engineer where some of plumes were. Warren seems to be ok with whats going on in the south Main st driveway along with the city no reason to think at this point no one knows nothing. Most properties in suspect pollution zones usually get tested for contamination before titles are passed are they not? This is just a long line of red herrings the city has created over the years , and having that much money on hand could cleanup contaminated land on the GGP dime.Its not like NEON was built on brownfield lot right? Cracked foundations and floors allow occupants to be exposed to contamination along with radon again has this south main st building been tested for anything or is it because its in South Norwalk its a given it hasn’t been. The reason the Norwalk Community Health Center moved from its Water Street location to Connecticut avenue was because their clientele was not concentrated in South Norwalk and their building wasn’t working for the services they needed to provide. Why can’t our elected officials ask for the data about what services are needed in the South Norwalk and locate them in a centrally located and accessible to transit location? Why must every thing be a reactive measure to failed policies? Norwalk needs a community center, and one that focuses on youth. Get a task force together and spend some dollars on a strategic plan with a real capital budget and do the right thing. I’m with John S 100%. What was the Neon board doing – why were there never financial audits – where did the unaccounted $400,000 go? So have SoNCC audit,this does seem more like funding SoNCC in a backhanded way. More in favor of the latino than the community as a whole. It hard when you just move in a direction that doesn’t help it’s community. if it happen these community people should go to Hartford, another way of keep the South Norwalk Community down, just for the high end developers. Looking more like? I agree with Mr. McCarthy this is crazy! If City uses taxpayers money to purchase the building it should become a city building period ! Rent it out and stop giving away taxpayer dollars.